Hogarth is a girl 5 year old ferret now. The name, as you are probably wondering, was given to her by the previous owners... and they thought she was a he. We did a little research and found out otherwise. Her nicknames include Hogalicious, HogiWogi, and most commonly Hogie. Anyways, we fell in love with our little fuzzie. But eventually, our friends came back. We were dying to see them, and they were dying to see us... er, Hogie. And us. To our kids liking, they let us keep her, seeing how we love her so much. We let them visit as often as they please, though. And they are planning on getting another fuzzy. Loved reading your story. I'm so glad your friends decided to let you keep her. 3 years is a long time to care for any pet and not consider it as your own. Once they get another fuzzy you can organize ferret playdates with Hogie ;-) Watching two ferrets play and weasel war dance together will put a smile on everyone's face. Enjoy your little one and, for a long life together, understand that there is a luck factor along with an "on top"/alert one as well (do not read paranoiac). 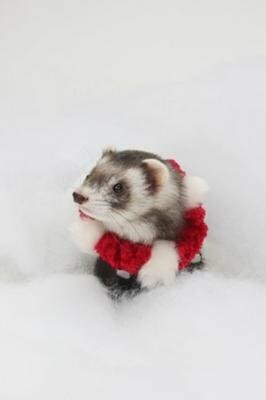 Be aware of the main possible illnesses a ferret (specially an American ferret) can go through as, should they strike, timing is a very important thing... so is constant ferret proofing as this little creatures for sure have more sense of adventure than common sense! :) (I describe it as having a 2-3 year old around but with longer nap times) And, last but not least, tons of love and fun times, as a happy ferret is a stronger ferret.